I am going to include some of the stories behind these pictures this time (details coming, of course, from the Australian War Memorial collections, though I've reworded), but again, I feel the greatest impact comes simply from looking into the faces of these very young men who fought and often died, and shouldn't have. Second Lieutenant Alexander Finnie, 4th Squadron, Australian Flying Corps (AFC), of Botany, New South Wales. He enlisted in 1914 as a sapper, was evacuated from Gallipoli in 1915 with gas poisoning, returned in 1916 and trained as a pilot in 1917. He was killed in a mid-air crash in May 1918 while shooting down balloons over the German lines-- aged 25. Corporal Mechanic Alexander Willliam Connington, 3rd Squadron Australian Flying Corps, of Goulburn, New South Wales. He enlisted in 1916, serving in France from August of 1917, and was in the process of training to be a pilot when he fell ill with pneumonia and died in Wales, October 23, 1918. He was 23. Lieutenant Frank Alexander Butterworth MM, 30th Battalion, of Hay, New South Wales. He enlisted in 1915 and was awarded the Military Medal the next year for gallantry. He was killed in October 1918, just a month before the end of the war, aged 23. His brother also died in the war. Lietentaunt Frank Hubert McNamara of the Australian Flying Corps. In 1917 he performed a daring rescue of a fellow pilot behind enemy lines (nearly dying in the process) for which he was awarded the Victoria Cross. He lived until 1961. 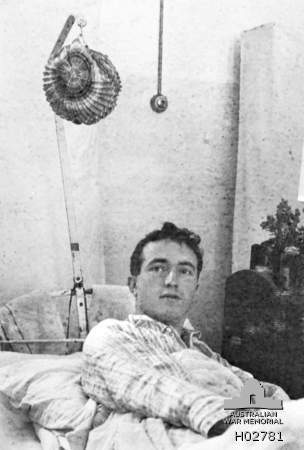 Another photograph of Frank Hubert McNamara, 23, recovering in hospital after the rescue for which he was awarded the Victoria Cross. 2nd Lieutenant John Michael Stanislaus Gregor Stevens, a pilot of No. 1 Squadron, RFC, originally from Sydney. He was described in his squadron's records as "a very jolly fellow who could do anything with a Nieuport except take it off." In 1917 he was wounded while flying and died from complications of the following surgery. He was 17 and ten months. Thomas Charles Richmond Baker, taking a picture of himself in a mirror. He enlisted in 1915 and was awarded a Military Medal for gallantry in 1917. In the same year he joined the Australian Flying Corps, where he flew over forty raids as a flight commander. He is credited with destroying at least eight enemy aircraft, and thus an ace. On November 4, 1918, he was killed in action. He was 21. I find this one especially touching in the way it shows how little difference there is between a twenty year old in 1916 and a twenty year old today. Just like any number of young people, he's taking a picture of himself in a mirror. You see these pictures all the time today. And yet, through all this he was fighting in a war that wasn't his, going up into the air every day not knowing if he'd return... and ultimiately, not returning. Today Thomas Charles Richmond Baker would have had such a different life-- and that just breaks my heart. very nice photos but sad stories. we often forgot how young these guys are. very touching photos though.